Do the Red Centre Way to experience the real Australian Outback. 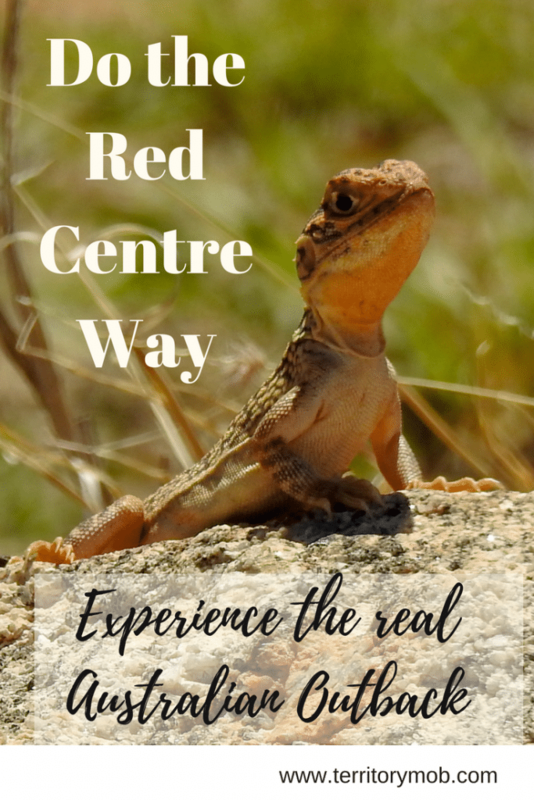 Living in Alice Springs for many years I was lucky to experience this extraordinary part of the Australian Outback, and to travel the Red Centre Way is one of those special moments in time. Locals call these mountain ranges the West Macs, enjoying the luxury of going ‘out bush’ camping as often as they can. Stretching over 200 kilometres west of Alice Springs, the West Macs make an impression. 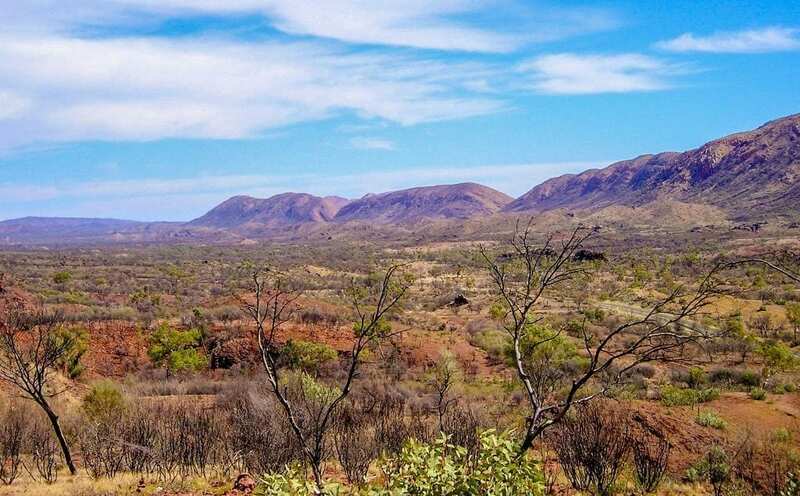 Drive west from Alice Springs along Larapinta Drive, by the time you lose sight of the township you’ll be in the West MacDonnell National Park traveling along the Red Centre Way. Spend time exploring the highlights of this region. Take a day, a week or several to experience the power of these magnificent ranges. Flynn’s Grave, a memorial to the Reverend John Flynn, founder of the Royal Flying Doctor Service. The stunning scenery, unique plants, birds and animals of this region are what our visitors look for when they arrive. Explore the many gorges and waterholes across this unique landscape and keep your eyes open for some of the most amazing wildlife you will ever see. There are plenty of walks to take. Short walks or extreme adventures such as walking the Larapinta Trail for more experienced hikers. Ride a bike through the sealed bike path connecting Flynn’s Grave with Simpson’s Gap – a distance of 17 kilometres. 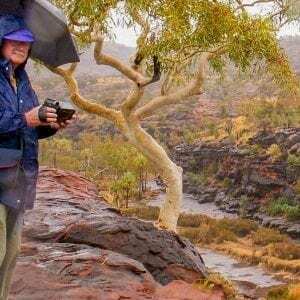 Famed by the Aboriginal watercolourist, Albert Namatjira, the vivid colours of the West MacDonnell ranges have been painted and photographed by visiting artists and photographers around the world. Even a short drive through the ranges just out of Alice Springs is spectacular and needs to be a part of your outback holiday experience. Showcasing the first of the Gaps west of Alice Springs, Simpsons Gap is one of the most prominent gaps in the West MacDonnell Ranges. At dawn or dusk you may spot a black-footed rock wallaby along the walking track or near the waterhole. 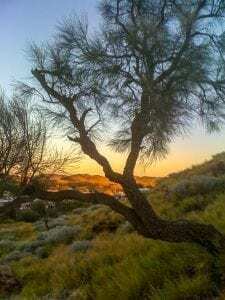 Enjoy the many short walks featuring native plants, ancient ghost gums and views of the ranges. Simpsons Gap is also located on the Larapinta Trail and from here you can walk sections one or two. Camping is allowed at Simpsons Gap for Larapinta Trail walkers only. Standley Chasm is at its most dramatic an hour either side of noon on a clear sunny day. The sheer chasm walls glow with reflected sunlight, creating a breathtakingly vivid display of rich colour. Flood waters over many thousands of years have carved this beautiful spot through the mountains. The walkway to the chasm follows a slow trickling creek with spring-fed pools attracting a number of birds and wildlife. The 20 minute one-way walk through to the chasm is easy for most visitors. Just 46 kilometres west of Alice Springs you will come across an intersection which to choose your destination via either the ‘inner’ or ‘outer’ loop of the Red Centre Way. Left – to explore the ‘inner loop’ taking you through to Owen Springs Reserve, Palm Valley and Hermannsberg. Right – will take the ‘outer loop’ through stunning scenery of the Red Centre Way through Ellery Creek to Glenn Helen and Mt Sonder. Owen Springs Reserve is one of my favourite places to visit. Only a half hour drive west of Alice Springs, and over 150,000 hectares open for camping, 4WDing and bird watching. The Reserve has two camping areas allocated to camping a bush settings. 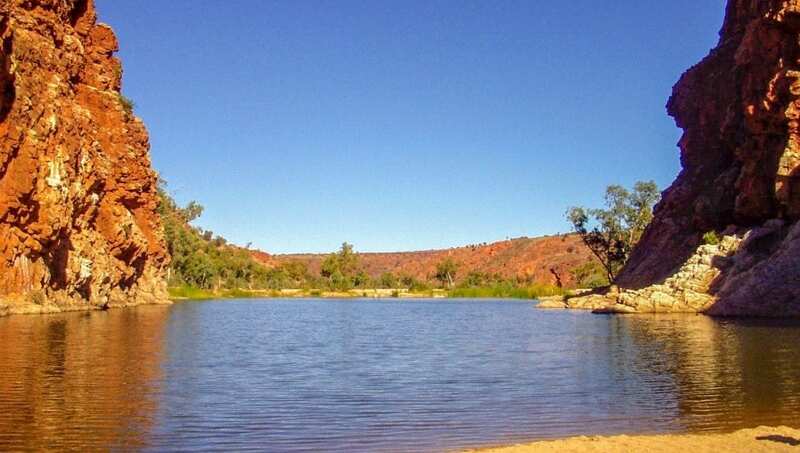 Redbank Waterhole is a free camping area located right next to the Hugh River, on the southern end of the reserve. Only 5 km off the Stuart Highway it is easily accessible. When there’s water in the waterhole, it’s a perfect place to swim. It’s picturesque and surrounded by tall river red gums and grassy camping spots along the banks. Lawrence Gorge runs through the Waterhouse Ranges. 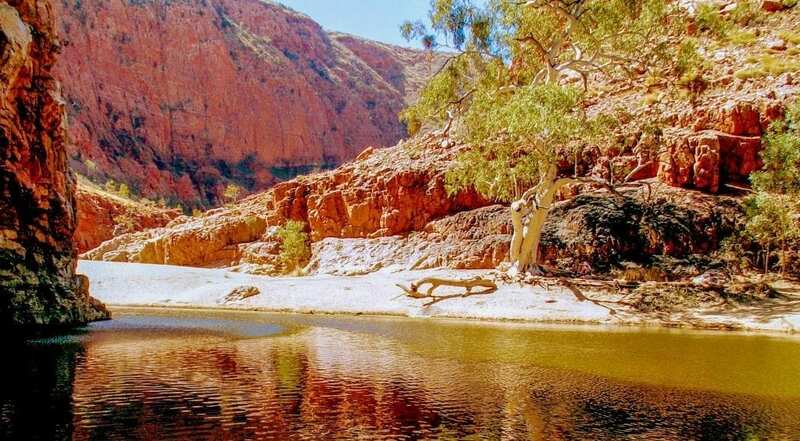 There are many great campsites along the Hugh River and you’ll likely encounter lots of Alice Springs locals taking a weekend break. Great for swimming, relaxing with friends, reading and an opportunity to do some birdwatching. Wallace Rockhole is a western Arrente Aboriginal Community just over an hour’s drive from Alice Springs. Take an aboriginal guided tour to see ancient rock art and learn about the surrounding landscape. Experience the culture, learn about bush tucker, bush medicine and many of the animals native to the region. Camping facilities are available. Palm Valley is located within Finke Gorge National Park and one of the most impressive places to visit in Central Australia. The surrounding area is culturally significant to the Western Arrernte Aboriginal people. 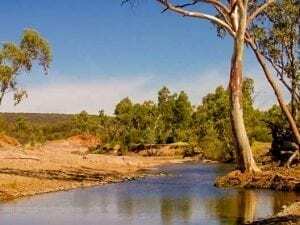 The Finke River is famed as the oldest river in the world following it’s original watercourse. Palm Valley is a maze of sandstone amphitheatres, pinnacles and gorges and home to the rare Red Cabbage Palm after which the valley is named. A must visit! The Hermannsberg community was first established as a Lutheran mission in the 1880s as one of Central Australia’s first settlements. The community of Hermannsburg is famous as the home of watercolour landscape artist Albert Namatjira. The National Trust-listed Hermannsburg Historic Precinct includes historic German-style buildings constructed when the mission was first established. They are now restored to their original 19th-century condition and utilised as the Kata Anga Tea Rooms, a museum and the Namatjira Gallery. Original paintings by the Albert Namatjira are on display alongside other famous artworks. Camping facilities are available at Hermannsburg. If you have a 4WD vehicle, you can continue on to rejoin the ‘outer loop’ of the Red Centre Way at the Gosse Bluff intersection. This will take you through the stunning scenery of the ‘outer loop’ of the Red Centre Way and take you through some of the most spectacular landscape of all. A popular picnic, hiking and camping spot for Alice Springs locals and tourists alike. The icy cold waters are perfect for swimming and canoeing on hot sunny days. The waterhole is very deep and can be very cold. Be cautious if swimming in the winter months. Do not to dive into the water. There are boulders and submerged trees below the water. Access to Ellery Creek Big Hole is only short distance from the main road, an unsealed dirt road but 2WD accessible. Camping facilities are available. Serpentine Gorge is less known but is quite unique because of the magnificent look-out which provides amazing views into the valley and back across the West MacDonnell Ranges. It’s a quiet place to go camping, relax, listen to the birds and watch the wildlife come down for a drink. Enjoy a secluded swim in the small swimming hole. A further 5 minutes drive takes you to the ruins of Serpentine Chalet, built as a luxurious resort venture in 1958. Serpentine Chalet experienced a number of setbacks throughout it’s early days but when the Glen Helen Homestead was opened to tourists in the early 1960s, the Chalet was closed. The Ochre Pits offer one of the few opportunities for visitors to see an ochre deposit that is still used traditionally by the local Arrente people of this area. You will see different coloured ochres which have been a source of materials for Aboriginal people for thousands of years. The Ochre Pits is a registered sacred site and protected by Northern Territory Sacred Sites and Parks & Wildlife legislation. Please do not touch or interfere with the ochre. 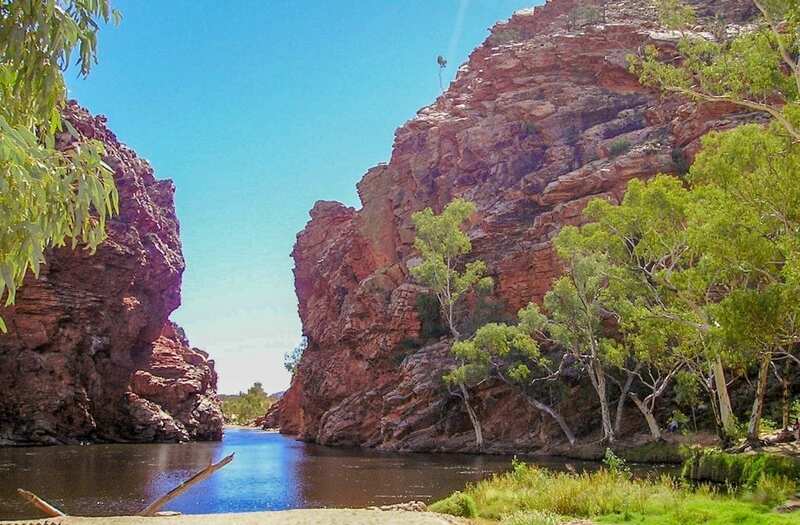 Ormiston Gorge is one of the most stunning gorges along the West MacDonnell Ranges and one of my most favourite spots to visit. Plan to stay a while – go swimming, camping, hiking and chill out for a while. Relax! An abundance of native animals live around the waterholes and birdwatching is a popular activity at Ormiston Gorge. If you’re a keen birder or twitcher you’re likely to spot some of Central Australia’s most sought after birds whilst at Ormiston. Glen Helen Homestead Lodge is just a little over 10 kilometres west of Ormiston Gorge. Formally one of the early a cattle stations in the area, rustic adaptions have been made to the heritage-listed buildings to accommodate visitors at Glen Helen. The Homestead Lodge is a licensed venue with motel style accommodation, meals and camping. Live performances by talented Australian musicians appear 5 nights per week April through November make this a welcome place to relax after a hard day exploring the outback. Mt Sonder is the highest point in the West MacDonnell Ranges and marks the western end of the Larapinta Trail from Alice Springs. Choose to walk the trail to the top of Mt Sonder, or view this amazing sight from the nearby vantage points, it will be a spectacular to see. Look for the wide range of birds of prey, such as the Wedge-tailed eagle and the Peregrine falcons circling the summit, riding the thermals. The foothills of Mt Sonder are home to many birds, wildlife and native plants and vegetation which become more prevalent on the high slopes and stony cliffs. The West MacDonnell Ranges are full of history and culture. 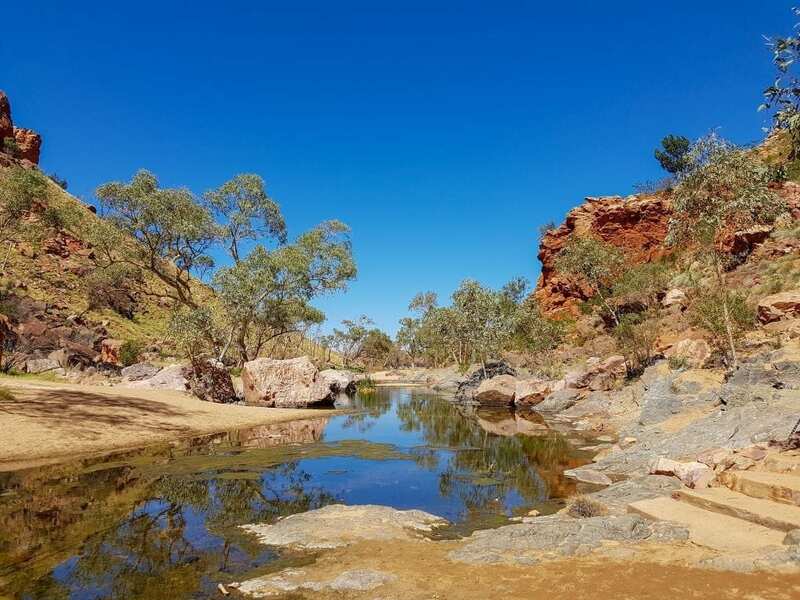 The beauty of the changing landscape through the West MacDonnell ranges will take your breath away and delivering a sense of solitude and feeling at one with nature. If you have a 4WD there are options to drive south to Kings Canyon and Uluru via the Red Centre Way (formally the Mereenie Loop Road). Be aware that this road is unsealed and can be quite rough. It does pass by some exceptional scenery including sand dunes, gorges and beautiful waterholes. Have you travelled the Red Centre Way yet? Did you swim in the waterholes, walk the walking tracks and have you seen our local birds and other wildlife? What memories did you take home with you?